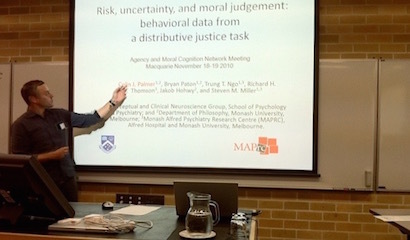 The Agency and Moral Cognition Network brings together philosophers, psychologists and cognitive scientists from across Australasia for regular meetings and the exchange of research. It is informed by contemporary research in the relevant sciences and seeks to identify and focus upon key issues in the areas of moral reasoning and judgment, memory and emotion, skilled agency, disorders of agency, neuroethics, neurolaw, and moral and legal responsibility. One of the goals of the network is to capitalise on growing interest and engagement in interdisciplinary research in agency and moral cognition and to provide a platform for research collaborations and grant applications. The network aims to develop research links and exchanges with the Moral Psychology Research Group in the US, the Florey Neuroscience Institutes in Melbourne, the Oxford Centre for Neuroethics in the UK and a number of European partners. Information available under our conferences and workshops events page. 2016: Workshop on October 14, at CAVE, Macquarie University. 2015: Meeting on November 4-5, at CAVE, Macquarie University. Keynote speaker: Prof. Heidi Maibom (Cincinnati), "Imagining Feelings." 2014: Meeting on May 29-30, at CAVE, Macquarie University. Keynote speaker: Prof. Fiery Cushman (Brown University), "Why Learning Matters for Morality." 2013: Meeting on September 25-26, at Florey Neurosciences Institute, University of Melbourne. 2011: Meeting on July 21, at CAVE, Macquarie University. Topic: "Character, Capacity, and Personality."